You must be 25 years old to rent this home! 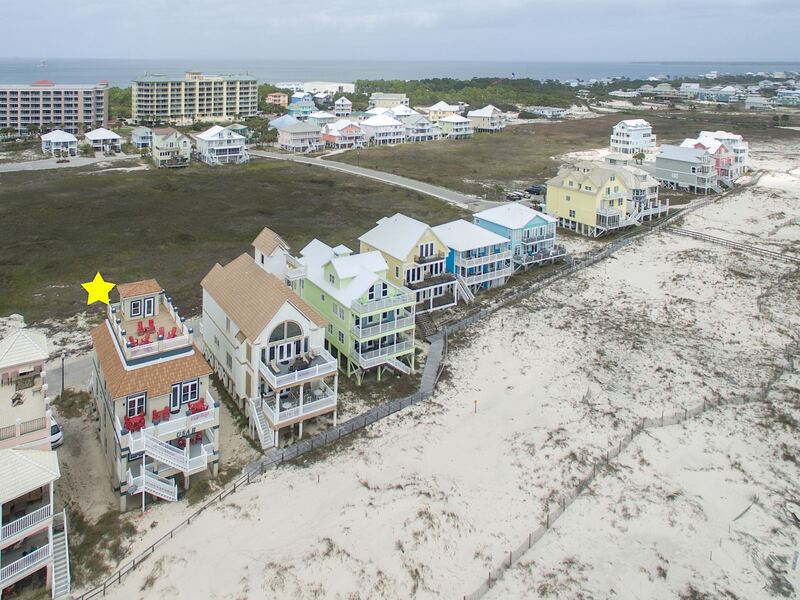 This beautiful beach front house with 5 bedrooms and 5 baths is located in the private Dunes subdivision. 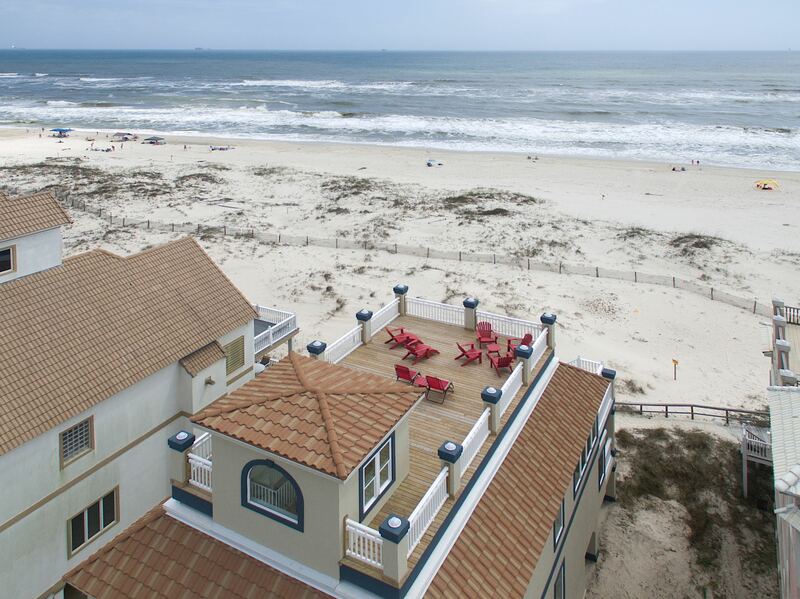 Discover Gulf Shores and the Fort Morgan area during your beach vacation. They have the best to offer such as exciting shopping, dining, and entertainment experiences. Savor some of the Gulfs finest cuisine including oysters and shrimp Experience the annual Shrimp Festival and the Hangout Festival which attract thousands of people and artist from around the world. 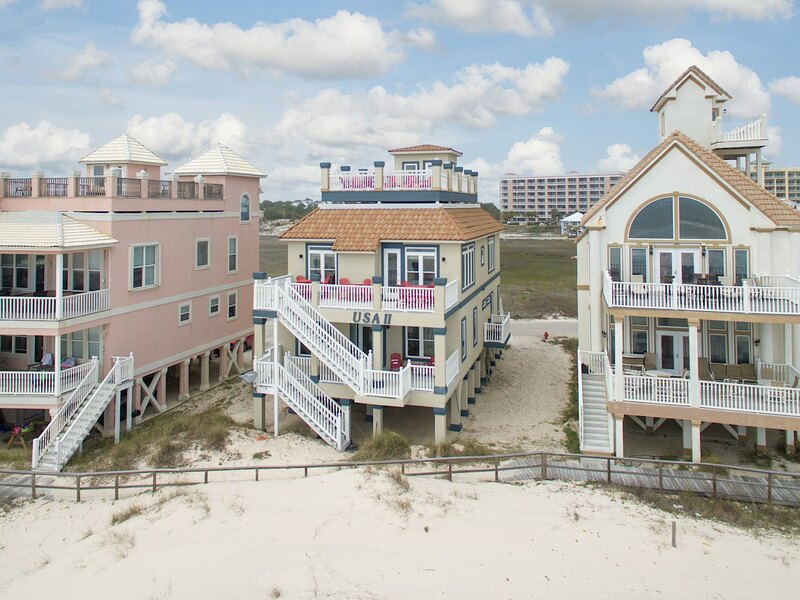 Gulf Shores has a variety of enticing shops and restaurants beckoning visitors and locals alike. Reserve this vacation home, and enjoy comforts including a fully stocked kitchen, flat screen tv and complimentary wireless internet.Guests love to walk or ride their bikes across the street to the marina for lunch or dinner or for a charter fishing trip. The historical Ft. Morgan is just a mile away. Journey to Fort Morgan where the white sandy beaches of the Gulf will sooth and rejuvenate your soul. You will discover that there's more to see and do than you ever imagined where the Gulf meets the Bay. Call Sunset Properties or book this home online for the perfect getaway and you will get a vacation that was made just for you. "Close access to the beach. Beach was perfect...not many people. We felt like we had the beach to ourselves. Had issues with WiFi on our we ate up some data. Elevator was a great help with. Coming in and leaving!!! Sunset Properties was very efficient with contact information, access information, etc. Very personable and professional...will definitely use them again with future trips!" "Awesome!! We love to hear from our guests and we are so glad that you enjoyed your time in USA 2! Isn't that a breathtaking view from the rooftop deck?? I hope you will call us in the future and let us book this beautiful home for you again! " "We stayed for a 4-day holiday weekend with 4 adult couples and 4 children. The house was absolutely perfect for this size group. The house was huge, clean and well-maintained. Covered parking for 4 cars was SO nice (it rained on and off), and the elevator made the trip so easy! The view is amazing, the decks are perfect, and the management company could not have been more friendly and helpful. Love the app and ability to communicate via text. The only thing we didn’t love was the long-ish walk to the beach. 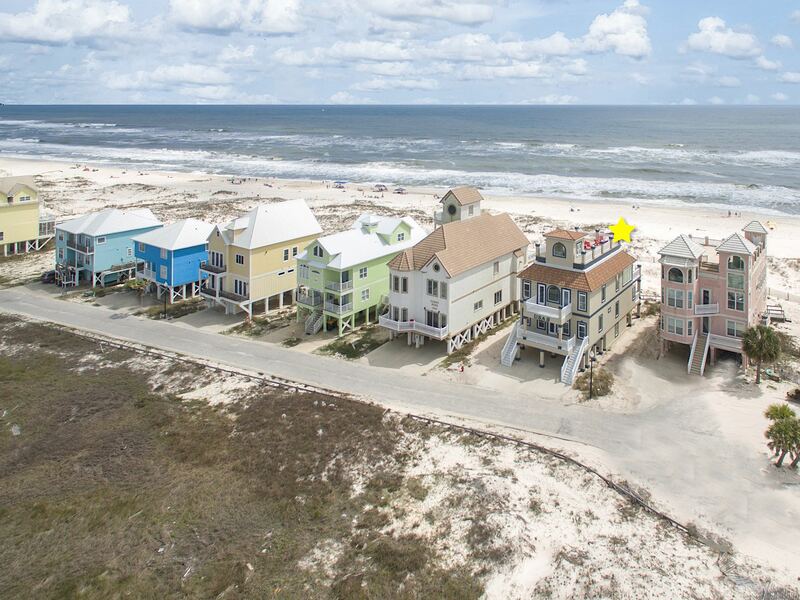 This property is near the end of a long row of houses, with only one beach access boardwalk in the middle. But the neighbors told us they have permission to add another boardwalk closer to the house, so hopefully that is coming. Highly recommend this house. We’ll be back!" "Yay, Maria! I am so glad you enjoyed your stay at USA 2. 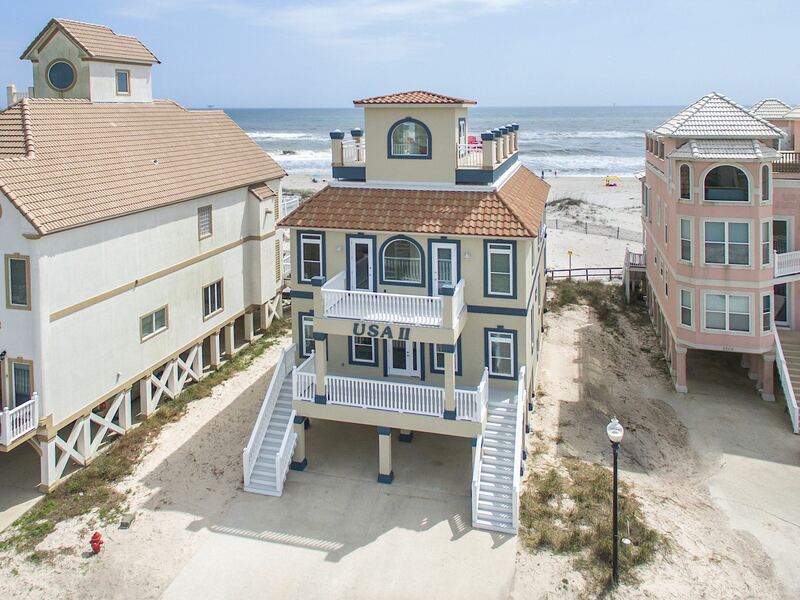 I agree this beach front house has a stunning view. We can't wait to have you back, just let us know when you're ready for your next vacation!" "The USA II was a fantastic and clean house. We had 12 people in our group and all had plenty of space. Each bedroom has its own bathroom which was great. We were right on the beach and loved that aspect of the house. On this part of the beach we learned that you could leave your stuff on the beach overnight so it was there for you the next day! The decks were perfect for hanging out on when we were not on the beach. It was great having access to the pools as well (about a 5 minute walk). We had a couple of minor maintenance issues but they responded very quickly and on a Sunday! We had a great time and would stay here again! Tacky Jacks was just down the road from the house and was a great place to eat as well as Sassy Bass. It was an easy drive to downtown Gulf Shores and Orange Beach as well. We had a fantastic time!" "Awesome! We love to hear such great reviews from our guests! 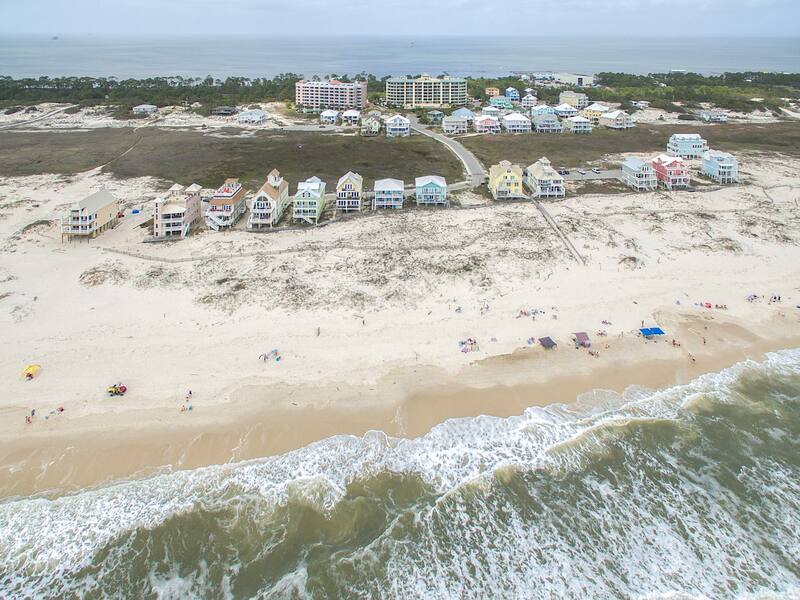 Fort Morgan is definately out of the hustle and bustle of the city, but close enough if you decide to shop or enjoy the different venues Gulf Shores has to offer. Please call us and let us book your next stay at USA 2!" "great enjoyable trip....wonderful house and perfect location at the end of the island...secluded and family oriented....security gate personnel not too friendly." "We are so glad you enjoyed your stay at USA 2. It is a truly beautiful home and the location is awesome! We love the peace and quiet here at Fort Morgan. We have a lot of repeat guests year after year who love the tranquility down here. We hope you will become one of our repeat guests!"